Forgive the alliteration - my English teacher background gets the better of me sometimes. Tamales at El Charro!!! These are the best tamales anywhere and we have eaten a LOT of tamales. We have tried these beauties several times and they are consistently good. The vegetable ones are the best followed closely by the pork carnitas ones. 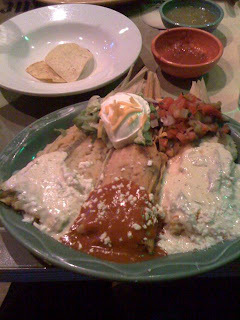 If you are a tamale afficionado like we are, you must try these if you are ever in Tucson - heck, just plan a trip - they are that good!! 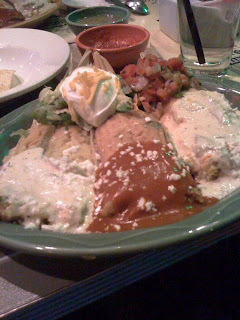 Would we classify this as "dirty Mexican" food? Now this makes me want to find a recipe for veggie tamales. Refried beans are veggie too, and chips, quac, salsa....I am feeling a mexican theme night soon in my kitchen. When something is this good, never ask for the receipe. You don't want to know what's in them. Especially tamales. My mouth is watering. That looks so good.